What Day Of The Week Is October 16? 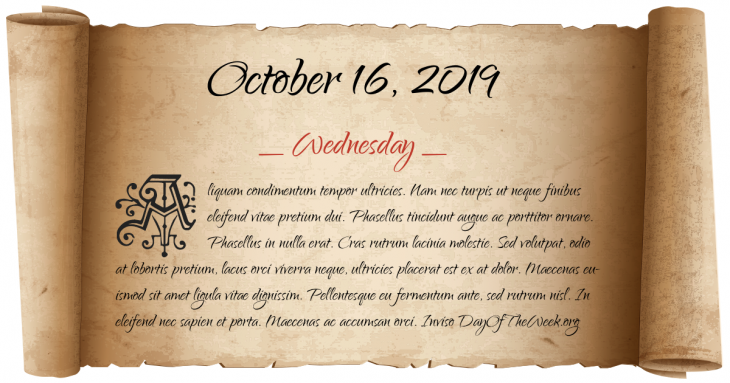 October 16, 2019 is the 289th day of the year 2019 in the Gregorian calendar. There are 76 days remaining until the end of the year. The day of the week is Wednesday. Wally Walrus, Woody Woodpecker’s first steady foil, was debuted at the The Beach Nut, a Walter Lantz’s cartoon. Nikolaos Zachariadis, leader of the Communist Party of Greece, announces a “temporary cease-fire”, effectively ending the Greek Civil War. Luby’s massacre: George Hennard runs amok in Killeen, Texas, killing 23 and wounding 20 in Luby’s Cafeteria. The Million Man March occurs in Washington, D.C.
Hawaii Earthquake: A magnitude 6.7 earthquake rocks Hawaii, causing property damage, injuries, landslides, power outages, and the closure of Honolulu International Airport. Who were born on October 16?